Mops are ubiquitous. 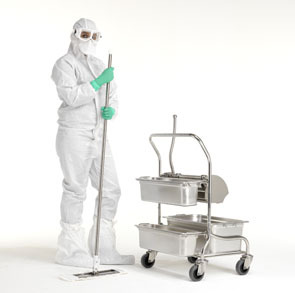 Nowadays, cleaning and disinfection of large surface areas of cleanrooms —and non-cleanrooms— have almost always been performed using a mop system of some type or variety. The practicality of such a tool for the purpose is clear: mops can hold a useful volume of detergent/disinfectant (or sporicide solution), which can then pick up a number of particles, fibres and other soils too. Materials improvements such as microfibre construction, add a factor to the mix. These variables work simultaneously, so careful thought and testing are required to determine not only the surface area that can be cleaned with a single impregnated mop, but also to ensure the adequate biocide is applied, and that contact times are achieved as per current regulation. There is yet another challenge: to prevent the mop from becoming soiled to the point it is no longer removing particles and fibres to an acceptable level. Reprocessing of microfibre mops for multiple re-uses adds a further dimension of deterioration of physical performance, which additionally has to be investigated and understood. With these considerations in mind, it is clear that the selection and qualification of biocides and mops cannot be considered separated activities. On the contrary, they are highly interdependent. The long-term interaction between biocides and application substrates such as mops is a well-documented effect: the reduction of many active biocide levels —due to binding losses or catalytic breakdown caused by mop application materials— can have an impact on the original microbiological qualification studies if the loss of activity is outside the justifiable limits. Similarly, some cleaning detergents (surfactants) may also be affected, reducing cleaning efficiency in this case. Time is a key variable in this process. Many aqueous biocides are not considered for long-term, pre-impregnation into application media. Because of storage, the final product may remain as "on the shelf" and not actually be applied to surfaces for many months, or even years. A good strategy would be to carefully select the substrate mop materials and biocides so that active material losses are understood and remain justified. The inter-compatibility should be tested with very short times of exposure limits; i.e. the time the biocide and substrate are in contact. Allowing only short exposure times requires keeping the biocide solution and mop separate from each other until the point of application. This may be achieved via the double/triple bucket approach. We must not forget, however, that this method can use a high volume of biocide and is not ideal for use within a compact or smaller cleanrooms due to the cleaning equipment’s footprint and difficulty in moving the equipment into and out of the cleanroom. 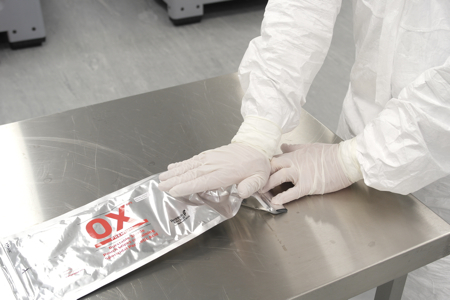 After over a year of development, a completely new product concept from Redditch Medical and Hydroflex could be a solution for keeping the biocide and mops separated until the point of application by the use of a special frangible pouch. The synergies between the two companies were key to the completion of this project. Redditch manufactures GMP biocide solutions and Hydroflex makes single-use, 100% polyester microfibre cleanroom mops. A German product, these mops have an efficient, 3D material structure that is able to cover uneven surfaces and effectively take up soiling contamination of all types while applying an even amount of Redditch's InSpec solution to the surface. As a single-use product, the mops offer a consistent uniform physical performance every time, which is a stark contrast to the physical variability of reprocessed mops. This technology utilises single-use disposable microfibre mops in conjunction with the InSpec range of disinfecting and cleaning agents and sporicides. 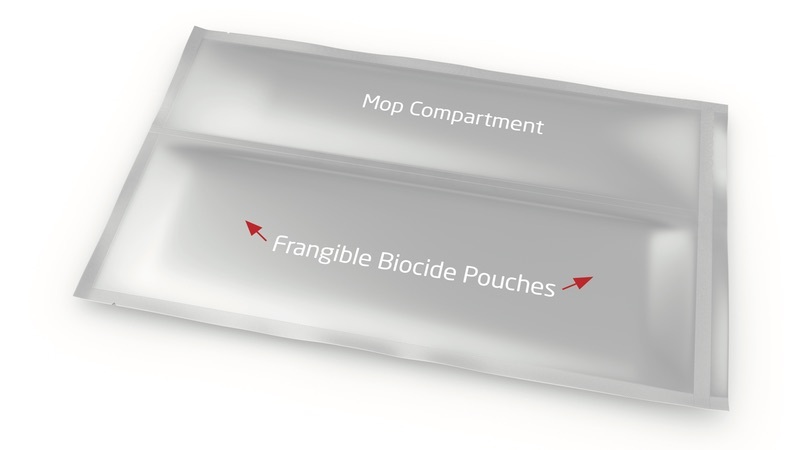 Two disposable polyester mops and the optimum volume of disinfectant are delivered in one packaging unit but are physically separated from each other by a frangible (burstable) compartment. The optimisation of biocide volume per mop was a detailed qualification of wetting speed, held volume and dispensed volume per sqm to ensure both economic use of biocide and to achieve the contact times expected. To ensure safe vertical use this held volume was also arrived at to avoid dripping occurring. The product is supplied with a sterile, double outer bag. For easy and rapid transfer into cleanroom areas, the outer layers are discarded at each stage for transfer. At the point of use, simply apply pressure to burst and release the disinfectant portion of the pouch into the dry mop portion. The product has been designed so that after one minute, the disinfectant will have evenly and sufficiently saturated the mop. 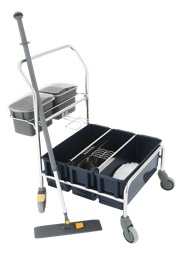 The mop compartment can be opened and the mops used within the stipulated period of time. 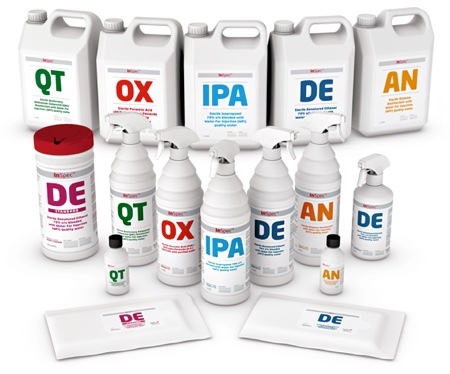 The InSpec biocide and detergent range can be allowed to remain in this state for one-to-two-hour maximum prior to application. In practice, there is no reason why the pouch could not be burst as required just a minute or so before use. The two-in-one system brought to the market by the collaboration between Redditch Medical and HydroFlex is a resourceful combination; a game-changer that only users will appreciate. N.B. This article is featured in the April 2019 issue of Cleanroom Technology. The digital edition is available online.